Australis cruise itineraries sail and more extensive than return to the same port of Ushuaia the itineraries are round trip. Darwin's Route from Ushuaia: Departing from Ushuaia (Argentina), retrace the route of Charles Darwin aboard HMS Beagle on this expedition cruise through the Fuegian Archipelago. Our adventurous eight-day (seven-night) itinerary includes legendary Cape Horn and historic Wulaia Bay, as well as Glacier Alley, the penguins of Tuckers and Magdalena islands, and the spectacular fjords that harbor Pía and Águila glaciers. Along the way you'll also encounter Patagonia's massive ice fields, lush sub-polar forests and secluded beaches. These itineraries are round trip, there are not only 4 days trip but you can also connect 2 paths forming 8 days and 7 night’s program. Linking the 4 days one way program with departure from Ushuaia to Punta Arenas with the Australis in 5 days OneWay route which departs from Punta Arenas and ends in Ushuaia form a 8 day trip called Australis in 8 days Trip (Ushuaia- Ushuaia). It can be also unified forming an Australis Round Trip in 8 days (Punta Arenas - Punta Arenas), in order to do this we must take the 5 days Australis One Way trip with departure from Punta Arenas to Ushuaia and in the southernmost city in the world we connect with the Australis in 4 days One Way itinerary departure from Tierra del Fuego to culminate in Chile. During the first hours in the afternoon we will do the check in in the city of Ushuaia, so we can embark in one of the expedition ships of Australis: Via or Stella. We will set sail from the most southern city in the World, Ushuaia, crossing the famous Beagle Chanel, going through Cape Hornos, and then navigating the Strait of Magallanes. The Beagle Channel is a marine way, which was originated by different stages during the quaternary glaciations period, which was later ruled by the sea. It is defined in the north by Ushuaia and the other extremes are defined by some islands such as the Stewart, O´Brien, Gordon, Navarino e Nueva, among others. The southern region of the southamerican continent, that limits to the north with the Drake Passage, also known as the Hoces Sea, is the well-known Cape Hornos. This sea is distinguished for separate the american continente from the Antarctic Peninsula. The pasaje which joins the two biggest mass of water in the World (Pacific and Atlantic Ocean), is the famous Strait of Magallanes. It is located in the middle of Tierra del Fuego and some other islands of the Pacific Ocean and the Chilean Patagonia, it has an strategic location in the south limit of South America. According to our fixed route, we will continue navigating by the Beagle Chanel and Murray Chanel, so then we can try to disembark (if weather conditions allows us to) and appreciate the nature beauties in the National Park Cape Hornos. We can realise about our arrival to this southern point, once we come accross with a 400 metres high hill. This place marks the most distant limit of the Group of the "fueguinas" islands, which is the most southern point in South America. It is also the point that defines the north extreme of the Drake Passage, it a sea which divides the American continent of the Antarctic Peninsula. The National Park is located in the "End of the World", has been declared as a Biosphere Reserve in the 2005 by the UNESCO. During sunset, we will disembark in Wulaia Bay, current archaelogical place which was home of one of the most greatest tribes in the region a long time ago: the Yámanas. It was in this very same bay that Fitz Roy, who discovered the Beagle Chanel, found the main anglican mission during his second expedition with the famous english naturalista Charles Darwin. During our tour along the bay, we will have the opportunity to appreciate its magnificent flora and geography. We will do a trekking in the "magallánico" woods which will be waiting with a great quantity of floral species like lengas, coihues, ferns, among others, and then we will arrive to a viewpoint where we will have an Amazing view. We will navigate the waters of different channels, such as Brecknock, Occasion, Cockburn and Magdalena with the main objective to get to the Seno Agostini. This is a fjord located in the region of Magallanes and the Chilean Antarctic territory, its characteristic is long and narrow, has steep walls on deep water. Divides the two sectors of the Mountain Range Darwin, the mountainous area called Navarro in the southwestern with a predominant presence of ice and the mountain range that covers Monte Buckland in the far north, named after an exceptional Italian explorer Alberto de Agostini. In the afternoon we will sail towards Aguila Glacier to disembark and walk along the Antarctic-Patagonian forest, an extremely wet and cold place, finally we will meet the Águila Glacier located in the Alberto de Agostini National Park. It is worth making the trek in this majestic place where we can feel that we are very small in the middle of this amazing place. We will go to Island Magdalena to try to make a disembark at the beginning of the day. This natural spot is distinguished for being the Natural Monument Los Pingüinos together with the small island Marta, one of the most outstanding group of penguins in the Chilean Patagonia. Another important attraction in the island is its lighthouse, an old one declared as a National Historial Monument which guides the navigators who go through the Strait of Magallanes. We will do a trekking to this high and illuminated tower to appreciate all the natural charm that the region offers, among them the important group of "magallánico" penguins. If we do this expedition crossing during September and April, we will replace this experience with a descent to Island Marta to enjoy watching the seals which we will be able to watch from our zodiac boats. This replacement is done because the groups of penguins in the mating period only stay in the island from October to March, every year. We will end our sea expedition by disembarking in the city of Punta Arenas when midday comes. We will start our fifth day of navigation on board of the Australis Cruise at dawn, now we are close to Seno Almirantazgo, a fjord which is located in the west coast of Tierra del Fuego. Between the important sea biodiversity and underwater we will be able to sight sea elephants and black - eyebrow albatrosses. Then, we will do the first descent in the Marinelli Glacier, Ainsworth Bay, the largest glacier among those which come from the Darwin Mountain Chain´s Ice Field. This giant of ice will surprise us with its ice walls about 40 metres high. This is the place where we will do some hiking so we can sight varied fauna and nature from the Magallanes woods: dams built by beavers and a great quantity of sea elephants which constrast with the amazing landscapes. Later on, we will go to Tucker small island, a certain point which delimits the northwest of the Whiteside Channel. The region has become now into a very valuable territory thanks to the natural nutrients which gave origin to the wonderful fauna that we will be able to watch. During our sixth journey, the route card in the Australis cruise will guide us to navigate through the main arteria of the Beagle Channel, we will get into by the northwest side of the Pia Bay chanel, so then we can make a descent in the glacier which has the same name. This snowdrift introduces in the Darwin mountain chain and it drains by the Waters of its bay. We will continue our crossing on the Australis to the northwest of the Beagle Chanel so we can gaze at the amazing "Glaciers Avenue" which is a narrow way in the Beagle Chanel where we will be able to watch many spectacular ice tongs that descend from the Darwin mountain chain to the sea. The name for this way was in honor to the glaciers which are particularly located one beside the other and very short distance between them to navigate. Those glaciers are: Germany, Italy, France, Spain, Netherlands and Romanche. 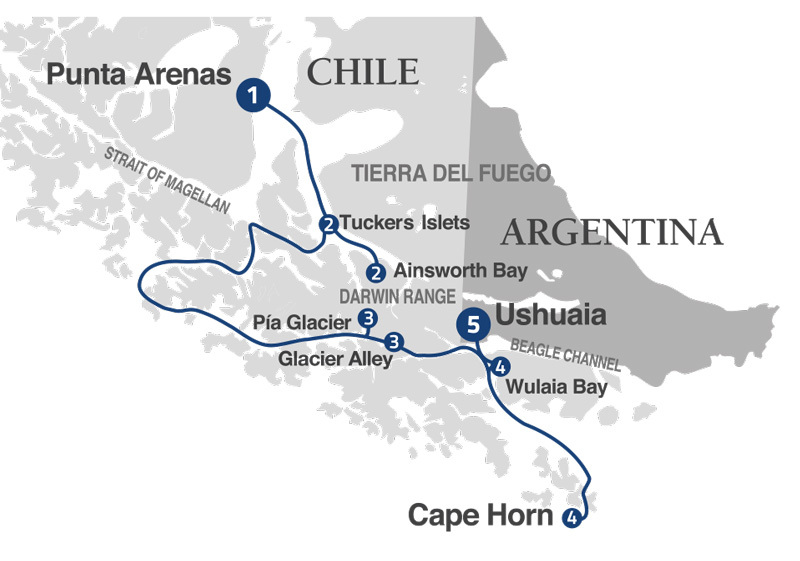 We will visit Cape Horn. To get to our goal we must sail through the Murray Channel reaching Nassau Bay then we will enter to Cape Horn National Park, depending on weather we will see if it is possible to disembark. This promontory was discovered in the early seventeenth century, has an elevation over 400 meters high. Was consider for a long time a shipping route for sailing ships crossing from ocean to ocean, leaving the rough waters of the Drake Passage to reach the cool waters of the Pacific. In 2005 it was called World Biosphere Reserve. After noon we try to make a dry landing Wulaia Bay in, a settlement for the Yagan Indians historically famous for the arrival of HMS Beagle which Captain was Fitz Roy and the researcher Charles Darwin in 1933. We do a walk surrounded by native conifers and beech, coihues, cinnamon and ferns that dreases this Antarctic Magellanic forest.